In recent years, discoveries made by pioneering expeditions to the far North have supported Charles Hapgood’s assertion that Siberia was much further south during the last Ice Age, and was then moved northward by an Earth Crust Displacement. So this Ice Age was in fact the last Polar Age, when the North Pole resided near Hudson Bay, Canada. Mammoth, horse and bison bones have been found on even the most northerly island archipelagos, dated to times of major ice sheet advance in North America. These herbivores roamed on ice-free islands near ice-free Arctic seas, while on the other side of the planet, ice sheets reached down into the subtropics of North America, and sea-ice covered the seas off the eastern coast of Canada and north-eastern North America all year round! And archaeologists have recently discovered that mammoth-hunting humans lived in northern Siberia during the last Ice Age, when mainstream scientists bizarrely claim this region was even colder than it is today. This claim is completely insupportable, but nevertheless is the orthodox belief, and academia doesn’t feel they have to justify it – it is simply a dogma. As Rochus Boerner wisely explained, it is the mark of all orthodox belief systems that they don’t feel the need to justify their assumptions. Because of this insistence that Ice Ages are global – caused by a lowering of temperatures worldwide – mainstream geologists have been unable to explain the presence of large herbivores near the Ice Age Arctic, nor explain how they became extinct. Alternatively, many supporters of the idea of extremely rapid, extremely catastrophic earth crust displacements have cited the extinction of the mammoths as proof. Charles Hapgood, however, believed that the last crust displacement was quite slow, taking up to 5,000 year to complete. The extinction of the Siberian mammoths has been frequently cited as evidence of a catastrophe occurring just before the dawn of civilisation. Their scattered, torn bodies have indicated a violent, sudden death, destroyed “as if by a cosmic hand in Godly rage”. Their remains are often found interspersed with layers of volcanic ash, all mixed up and frozen solid by the extreme climates of the Arctic Circle. This has led to speculation that they were killed by a very rapid Earth Crust Displacement – happening in a matter of hours, days or weeks – which caused the position of the North Pole to wander from its old home in Hudson Bay, Canada, into the Arctic Ocean. But this theory is without much foundation. The mammoths and other herbivores did not all die out suddenly, but survived in reduced numbers long after the alleged crust displacement 15-12,000 years ago. For example, mammoths survived in the Taymyr Peninsula much later than 10,000 years ago – long after the alleged pole shift ended. It appears that some mammoths were victims of the intense volcanism of that period, which modern research has revealed started 15,000 years ago and continued until 8,000 years ago. This increase in volcanism may mark the beginning of the last crust displacement, as such an event would no doubt cause many eruptions because of the stresses and strains it would put on the crust. Enormous eruptions would have suffocated the mammoths in ash clouds, temporarily blocking out the Sun and plunging Siberia into bitter cold snaps. But there wasn’t a rapid, permanent drop in temperatures, capable of wiping out the Siberian herbivores all at once. 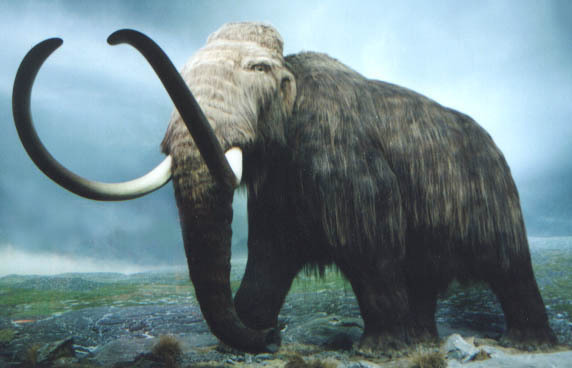 So the death and freezing of the mammoths provides little proof of a superfast pole shift. Alternatively, the mammoths’ slow demise is consistent with Hapgood’s theory of a ‘slow’ crust displacement, taking millennia to complete. The Arctic’s climate took a long time to cool down, partly because the warmth retained by this ocean would have taken a long time to dissipate; it would have acted as a ‘hot water bottle’, easing this region into its new home at the North Pole. Many writers have discussed how some mammoths were killed and frozen in the height of summer, with half-chewed flowers still on their tongues. Combined with their excellent preservation, this has been claimed to be proof of rapid freezing caused by an extremely rapid pole shift. However, it is more probable that these mammoths, killed in the midst of summer, were victims of intense volcanism, which blocked out the sun and plunged the world into a bitter cold snap. This happened many times around the close the Ice Age, and resulted in the disappearing ice sheets in North America making temporary re-advances. The fact that many mammoths survived in Siberia long after the death of these creatures in the midst of summer, shows that this rapid freezing was not permanent. So the steady decline of the climate was combined with more short-term, extreme fluctuations in climate, probably link to volcanism. The preservation of the mammoths is another confusing issue. As Hapgood commendably admitted, some well-preserved mammoths lived long before the end of the Ice Age, when Siberia was still temperate, and home to humans, lions, bears, etc. So they must have been preserved by some other method than freezing. For example, creatures can be preserved very well in bogs. Many of the North American mammoths were well-preserved in bogs for millennia following de-glacation of this continent, so preservation alone is not much use in determining the timing and speed of the last pole shift, nor for proving that Siberia has remained very cold since the end of the Ice Age. The debate over the Siberian mammoths has become pedantic, and tends to digress from the most important matter. For example, some writers and internet commentators get into arcane ‘debates’ about how the famous Beresovska Mammoth died, turning it into a tedious murder-mystery: did it fall into a cravass? was it drowned? or suffocated? or both?, etc. This suits academia very well, as they can therefore avoid the most important implications of the existence of Ice Age Siberian mammoths, which destroy the conventional belief in a global Ice Age. By refuting these less important theories about the mammoths, such as that they were all killed by a single cataclysm, prevaricating academics believe they can dismiss the fundamental issue as nonsense. But the key issue is not how exactly they died, or how they were preserved, but that they were living near the Arctic during the Ice Age in the first place. Whether fish or salamander, these were preserved in so fresh a state, the scientific correspondent reported, that those present immediately broke open the ice encasing the specimens and devoured them with relish on the spot. …We could picture the entire scene right down to the smallest details: how, flouting the higher claims of ichthyology and elbowing each other to be first, they tore off chunks of the prehistoric flesh and hauled them over to the bonfire to thaw them out and then bolt them down. 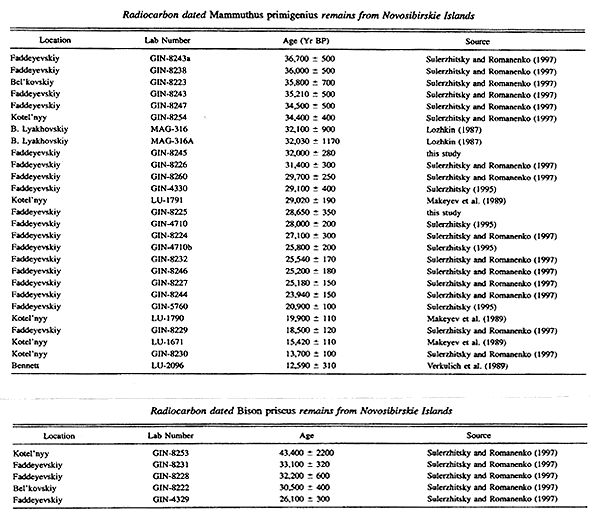 Bizarrely enough, Andreev et al hardly even commented on this amazing record of mammoth and bison remains. They didn’t discuss its implications, or how these animals lived there during the height of the Ice Age. Because expeditions to the Arctic are very expensive, scientists are very cautious and wary of discussing controversial ideas such as polar wandering, for fear of losing their funding. So the real power lies with the organisations which fund research, and they are clearly not prepared to publicly promote unorthodox theories. Anyone familiar with the scam-science of anthropogenic global warming will know how large organisations, such as foundations (eg, Rockefeller Foundation), government agencies (eg, NASA) and environmental campaign groups (eg, World Wildlife Fund), can ruthlessly corrupt scientific enquiry and silence ideas that don’t fit with their own agendas. This explains why Arctic explorers won’t even properly discuss the results of their own research! Many Arctic islands were much warmer during the Ice Age than today. A group of Russian scientists undertook an investigation in 2001, in collaboration with NASA’s Goddard Institute for Space Studies. They investigated the climate of Faddeyevskiy Island, within an archipelago called the New Siberian Islands. This island is located at 72° North, 144°East – far within the Arctic Circle (Figure 18). The current temperature there, during this supposedly “warm”, worldwide “inter-glacial” period, is on average –31°C in January, and +2°C in July, with a mean annual temperature of –15°C. In a word, cold. This island is without snow for only three months of the year, and has frosts throughout the whole year. The thickness of the permafrost in some parts of the island is 400 to 500 metres. Only 43 species have been recorded as currently live there, comprising high arctic tundra moss-herbs and grasses. These Russian scientists analysed ancient pollen and plant macro-fossils in order to reconstruct the island’s Ice Age climate. Their results showed that Faddeyevskiy Island was not covered by ice between 43,000 and 25,000 years ago – through the bulk of the Ice Age. They also doubted that ice covered the island even during the Last Glacial Maximum, as a similar investigation, made in 1989, discovered that nearby Kotel’nyy Island was free of ice between the LGM and the beginning of the Holocene. The flora of Faddeyevskiy Island during the last Ice Age included grasses and sedges, and even roses, buttercups and daisies. These conditions made the island a suitable home for many creatures, with enough vegetation to feed populations of grazing mammals. And there were grazing mammals there, in great abundance. Remains of mammoths have been found on Faddeyevskiy Island, which have ages from 36,700 and 18,500 years old, and are spread evenly over this whole time span. Mammoths therefore were in residence on the New Siberian Island during nearly all of the last Ice Age, including during the major advances of ice sheets in North America, such as the Farmdale Advance (25,000-23,000 years ago), the Iowan Advance (21,400-20,700 years ago) and the Tazewell Advance (20,000-17,000 years ago), and including the Last Glacial Maximum at the culmination of these advances. In addition to mammoth, the remains of rare bison (Bison priscus) have been found on Faddeyevsky and Bel’kovskiv Islands, dated to this same interval; and the remains of two horses were found on Kotel’nyy Island (near Faddeyevsky Island), radiocarbon dated as 29,100 (±400) and 19,100 (±120) years old, the latter horse having lived very near to the time of the LGM, around 20,000 years ago! So how could horses and mammoths live on the New Siberian Islands during the very height of the North American Ice Age? This question is simply avoided by the geologists who have studied these islands. It doesn’t fit in with the dogmas of mainstream Science, so it is simply ignored. The main reason it is ignored is because this evidence utterly destroys the idea of a global ice age, involving a lowering of global temperatures; and it leaves all conventional theories on the cause of Ice Ages in tatters, such as the farcical idea that they are caused by Milankovitch Cycles. Put simply, it is physically impossible that mammoths could have lived near the North Pole during times when ice sheets formed in almost subtropical latitudes. It violates the laws of thermal physics, and can reasonably be dismissed as nonsense. The only plausible explanation is that the rise and fall of Ice Ages is caused by successive pole shifts, and that the North Pole was in Canada when mammoths were living on the Arctic’s island archipelagos. But geologists prefer to live in a virtual reality, where they ignore the facts and mislead the public about the true history of Ice Ages. They are supported by the mainstream media, which perpetuates the myth of global Ice Ages and publishes propaganda designed to marginalise and discredit the ideas of Earth Crust Displacement and Polar Wandering. To paraphrase and adapt the words of Anthony Browne (from his book The Retreat of Reason), there is a conspiracy not so much of silence but of denial that stretches across the media and mainstream Science. There is endemic dishonesty towards the public, but because everyone is in denial to each other, few realise it because their virtual reality becomes widely accepted as truth. This received wisdom is in fact easy to disprove – it just requires them to look at the facts – but everyone has an emotional investment in not disproving it. This collective denial so envelopes the media-scientific elite that they have little idea how detached their world-view is from reality. The presence of a warmer Ice Age climate in the Arctic than today is irrefutable, but when it comes to discussing the cause of Ice Ages, this fact ceases to exist. Mainstream geologists then develop their theories based on the assumption of a global Ice Age, wherein the Arctic was colder in the Ice Age. So they are practitioners of doublethink – when it suits them, they can believe that black is really white, and warm is really cold! …the power of holding two contradictory beliefs in one’s mind simultaneously, and accepting both of them….. To tell deliberate lies while genuinely believing in them, to forget any fact that has become inconvenient, and then, when it becomes necessary again, to draw it back from oblivion for just so long as it is needed, to deny the existence of objective reality and all the while take account of the reality one denies…"